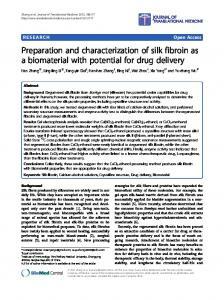 The preparation of regenerated silk fibroin microspheres Zhengbing Cao, Xin Chen, Jinrong Yao, Lei Huang and Zhengzhong Shao* Received 1st March 2007, Accepted 8th May 2007 First published as an Advance Article on the web 22nd May 2007 DOI: 10.1039/b703139d The objective of the present study is to investigate the possibility of preparing pure protein microspheres from regenerated silk fibroin (RSF). It is found that RSF microspheres, with predictable and controllable sizes ranging from 0.2 to 1.5 mm, can be prepared via mild selfassembling of silk fibroin molecular chains. The merits of this novel method include a rather simple production apparatus and no potentially toxic agents, such as surfactants, initiators, crosslinking agents, etc. The results show that the particle size and size distribution of RSF microspheres are greatly affected by the amount of ethanol additive, the freezing temperature and the concentration of silk fibroin. Finally, the mechanism of RSF microspheres formation is also discussed based on our experimental results. thread core, and glue-like protein termed sericin that surrounds the fibroin threads to cement them together.15 It is also found that silk fibroin is a native fibrous protein and consists chiefly of the repeated polypeptide sequence of Gly– Ala–Gly–Ala–Gly–Ser.16,17 In recent years, silks and the silk fibroins have been widely used as biomaterials, e.g. surgical suture, wound covering material, soft contact lens, scaffold for tissue engineering and controlled release carrier for their impressive biocompatibility and biodegradability.18–20 Previous research has indicated that the immune response mounted against silk in practical applications was mostly attributable to the glue-like sericin protein, not the core fibroin fibre.21 Also, there was evidence clearly showing that the silk was susceptible to proteolytic degradation in vivo and over longer periods it would be absorbed.14 Therefore, extensive studies have been carried out on the application of silk fibroin in non-textile fields regarding it as a kind of protein rather than a fibre.22–24 It is well known that silk fibroin can be processed into various forms, such as gel, powder, porous scaffold, nanofibre and membrane, which give silk fibroin a wide range of application.24–26 However, there is few reports about microparticles and nanoparticles which have potential application in such fields as controlled release and gene engineering.27,28 In this paper, we present a new approach to prepare a protein microsphere based on the self-assembling of regenerated silk fibroin (RSF) under very mild conditions, with rather simple production apparatus, and without any surfactant, initiator, cross-linking agent, or toxic organic reagent that would adversely affect the living body. salt. The dialyzed silk fibroin solution was centrifuged at 6000 rpm for 10 min. Then, the supernatant was concentrated according to the method reported previously.29 The concentrated silk fibroin was diluted to a series of RSF solutions with concentration ranging from 1.0 to 10% (w/w) (determined by weighting method), and stored at 4 uC for further use. All other reagents were analytical grade and used as received. were suspended in a series of phosphate buffers and measured by a zeta potential analyzer (zetaplus, Brookhaven, US) at 25 uC. The instrument was routinely calibrated with a 250 mV latex standard. Preparation of RSF microspheres After a certain amount of ethanol was added under gentle stirring (100 rpm) at 25 uC over 2 min, each of the RSF solutions with concentration from 1.0 to 10% (w/w) was incubated in a refrigerator at freezing temperature (25 to 240 uC) for 24 h. Then the frozen sample was defrosted at room temperature. It was found that the original transparent solution was turned into a milky suspension. Eventually, dry particles of RSF could be obtained by lyophilizing with a freezing dryer after stable RSF microspheres were collected by centrifugation (12 000 rpm, 30 min). Determination of particle size and its distribution The milky suspension was diluted 100 fold with de-ionized water, then the size and distribution of RSF microspheres was measured by photon-correlation spectroscopy (PCS) using a Malvern autosizer 4700 (Malvern Instruments Ltd., Malvern, UK) with a scattering angle of 90u at 25 uC. In order to verify the reproducibility of the preparation RSF microspheres assembled under the typical process described above, the procedure was carried out at least three times for each of the individual RSF microspheres. Fig. 1 SEM images of RSF microspheres prepared with different volume ratios of ethanol added to SF solution. SF concentration was 3% (w/w), freezing temperature was 220 uC. VEtOH/VSF (A) 1 : 20, (B) 3 : 20, (C) 6 : 20, (D) 8 : 20 and (E) 9 : 20.
might differ from those of ‘‘lyophilisomes’’ because silk fibroin is a particular fibrils protein for which the conformational transition is very sensitive to the ethanol additive and strength induced during the icing of aqueous solution (see discussion below). Also, there was no evidence to show that the produced RSF microspheres were hollow particles. Particle size analysis showed that the RSF microspheres were quite homogeneous in size, which could be varied from 0.2 to 1.5 mm in a dry state by controlling the amount of ethanol added. Larger spheres with a wider size distribution was formed by adding less ethanol. When the ratio of ethanol to RSF increase to 9 : 20 (v/v) or higher, an interesting phenomena can be found. There were a number of irregular aggregates formed in addition to the small microspheres (Fig. 1E). 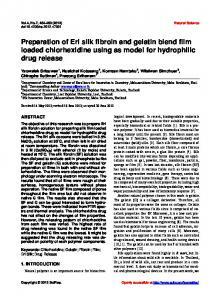 These aggregates indicated the formation of silk fibroin gel at higher ethanol concentration. We guess that the formation of the aggregates is an intermediate step in the wellknown sol–gel transition of RSF solution induced by a variety of factors.31 The AFM technique has been widely applied to obtain surface-dependent information in three dimensions on the nanometre scale. It can resolve surface details down to the atomic level and give morphological image in high resolution.32,33 The image of the shape and surface characteristic of the microspheres produced by RSF self-assembly was obtained successfully by tapping mode (Fig. 2), showing a uniform structure as in SEM photographs above. The 3D image of Fig. 2B further confirmed the fine spherical shape of RSF microspheres . The zeta potential is an important feature for the particle because a more pronounced zeta potential value, either positive or negative, favors the particle-suspension stability.34 The measurement on a zeta potential analyzer showed that the RSF microspheres were negatively charged. Their zeta potential values were slightly varied around 229 mV at the suspension of pH range 7–11. It suggested that the suspension of microspheres would be quite stable. Furthermore, the microspheres suspension could be stored for at least 3 months without visible coagulation occurring. Fig. 2 AFM images of RSF microspheres: (A) High image, (B) 3D image. SF concentration was 5.0% (w/w), freezing temperature was 220 uC, VEtOH/VSF was 8 : 20. Fig. 3 FTIR spectra of RSF microspheres prepared with different volume ratios of ethanol to RSF solution. SF concentration was 3.0% (w/w), freezing temperature was 220 uC. VEtOH/VRSF (A) 1 : 20, (B) 4 : 20, (C) 6 : 20 and (D) 8 : 20, respectively. Fig. 4 Particle size of RSF microspheres in the PCS measurement in correlation to the volume ratio of ethanol added to the SF solution at different freezing temperature (mean ¡ S.D., n ¢ 3). SF concentration was 3% (w/w). Fig. 5 Particle size and polydispersity index (PI) of RSF microspheres prepared at different concentration SF solution (mean ¡ S.D., n ¢ 3). VEtOH/VRSF was 8 : 20, freezing temperature was 220 uC. In a fresh RSF aqueous solution, the hydrophobic segments and hydrophilic segments are supposed to disperse randomly. Therefore, the silk fibroin molecules are easy to aggregate by physical or chemical stimuli, such as vibration, agitation, freezing and addition of organic solvents, to form the b-sheet structure and to be insolubilized.23,49,50 It is well known that ethanol is miscible with water in any ratio, but is a poor solvent for silk fibroin.51 In our study, when ethanol was added into the RSF aqueous solution, the molecular chains of silk fibroin interacted quickly and strongly with each other, and then the chains were rearranged in a regular array to some extent, resulting in a conformational transition from random and/or helical structure to b-sheet.28 As shown in Fig. 6, silk fibroin molecules firstly formed b-sheet microcrystals after the ethanol addition with gentle stirring. It has been reported that silk fibroin can exist as the b-sheet structure without precipitation from aqueous ethanol solution,52 for example, Yamada and co-workers have successfully found the microcrystals in an alcohol–silk fibroin mixture.33,53 After the formation of silk fibroin microcrystals, these b-sheet microcrystals could act as a seed for the growth of silk fibroin aggregation with continuous stirring.41 Subsequently, the shearing force produced during the freezing procedure of aqueous solution (kept in a refrigerator with a slow decrease of temperature) would induce silk fibroin conformational transition more completely. During the above process, the RSF microspheres could be maturated from the microcrystals by self-assembling. Such a microsphere may be composed of two ‘‘phases’’, e.g. the crystalline phase is the well-ordered core, and amorphous phase is the poor-ordered shell. Another possibility is that the amorphous phase entraps and attaches the crystalline phase to form a fine spherical shape. This solidification process of silk fibroin could be controlled by manipulating parameters, such as freezing temperature, concentration of silk fibroin and alcohol added that influence the hydrogen-bond formation to control the silk fibroin crystallization.54–56 It should be pointed out that none of those processes involves covalent cross-linking. The glass transition temperature (Tg) of protein is considered to be one of the major determinants of protein selfassembly. Li et al. 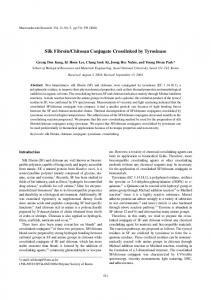 reported the effect of freezing temperature on the silk fibroin conformation and crystalline structure. 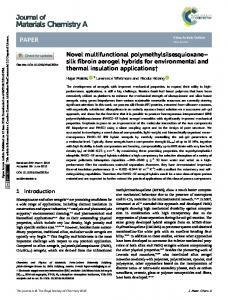 They found that there exists a Tg of silk fibroin ranging from 234 to 220 uC, and the initial melting temperature of ice in frozen silk fibroin solution is about 28.5 uC.57 In our case, we think that the amount of ethanol added and the process of freezing are crucial for the formation of RSF microspheres. The assembly of silk fibroin initiated with the b-sheet formation was induced by ethanol, and then the RSF microcrystals grew and solidified into a well-defined structure by isolation of frozen water (ice), and the shearing force produced by the freezing process. 4. Conclusion The present study shows that RSF microspheres with predictable and reproducible sizes ranging from 0.2 mm to 1.5 mm could be prepared by a mild self-assembling of RSF solution by adding a small amount of ethanol and quenching below the freezing point. The obtained microspheres all have fine spherical shapes with coarse surfaces without apparent adhesion. The particle size and size distribution could be controlled by the conditions of preparation, such as the amount of ethanol added and the freezing temperature. Moreover, after lyophilization, these RSF microspheres did not aggregate and could be easily dispersed in distilled water again. Acknowledgements This work is supported by the National Natural Science Foundation of China (NSFC, 20434010 and 20525414), the Science and Technology Development Foundation of Shanghai (05JC14009), the Program for New Century Excellent Talents in University of China (NCET, 00085901) and the Program for Changjiang Scholars and Innovative Research Team in University. Fig. 6 The scheme of silk fibroin self-assembly to microspheres with the presence of alcohol and freezing. 1 P. Ahlin, J. Kristl, A. Kristl and F. Vrecer, Int. J. Pharm., 2002, 239, 113–120. 2 J. L. Arias, V. Gallardo, S. A. Gomez-Lopera, R. C. Plaza and A. V. Delgado, J. Controlled Release, 2001, 77, 309–321. 3 M. Malmsten, Soft Matter, 2006, 2(9), 760–769. 4 D. Missirlis, J. A. Hubbell and N. Tirelli, Soft Matter, 2006, 2(12), 1067–1075. 5 I. Brigger, C. Dubernet and P. Couvreur, Adv. 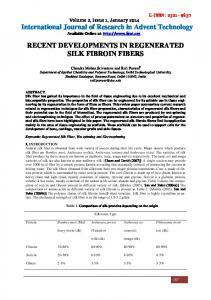 Drug Delivery Rev., 2002, 54, 631–651. 6 M. L. Hans and A. M. Lowman, Curr. Opin. Solid State Mater. Sci., 2002, 6, 319–327. 7 C. Weber, C. Coester, J. Kreuter and K. Langer, Int. J. Pharm., 2000, 194, 91–102. 8 G. M. Whitesides, J. P. Mathias and C. T. Seto, Science, 1991, 254, 1312–1319. 9 K. Fujita, S. Kimura and Y. Imanishi, Langmuir, 1999, 15, 4377–4379. 10 C. M. Dobson, Philos. Trans. R. Soc. London, Ser. B, 2001, 356, 133–145. 11 C. M. Dobson, Trends Biochem. Sci., 1999, 24, 329–332. 12 M. Reches and E. Gazit, Curr. Nanosci., 2006, 2, 105–111. 13 O. Ikkala and G. ten Brinke, Science, 2002, 295, 2407–2409. 14 G. H. Altman, F. Diaz, C. Jakuba, T. Calabro, R. L. Horan, J. S. Chen, H. Lu, J. Richmond and D. L. Kaplan, Biomaterials, 2003, 24, 401–416. 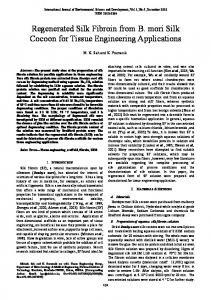 15 R. Nazarov, H. J. Jin and D. L. Kaplan, Biomacromolecules, 2004, 5, 718–726. 16 T. Yamane, K. Umemura and T. Asakura, Macromolecules, 2002, 35, 8831–8838. 17 R. Valluzzi, S. J. He, S. P. Gido and D. Kaplan, Int. J. Biol. Macromol., 1999, 24, 227–236. 18 L. Wang, R. Nemoto and M. Senna, J. Eur. Ceram. Soc., 2004, 24, 2707–2715. 19 M. Demura and T. Asakura, J. Membr. Sci., 1991, 59, 39–52. 20 K. H. Kim, L. Jeong, H. N. Park, S. Y. Shin, W. H. Park, S. C. Lee, T. I. Kim, Y. J. Park, Y. J. Seol, Y. M. Lee, Y. Ku, I. C. Rhyu, S. B. Han and C. P. Chung, J. Biotechnol., 2005, 120, 327–339. 21 B. Panilaitis, G. H. Altman, J. S. Chen, H. J. Jin, V. Karageorgiou and D. L. Kaplan, Biomaterials, 2003, 24, 3079–3085. 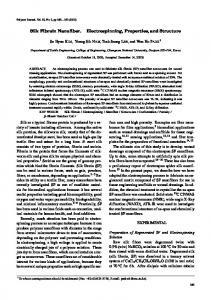 22 K. Inouye, M. Kurokawa, S. Nishikawa and M. Tsukada, J. Biochem. Biophys. Methods, 1998, 37, 159–164. 23 M. Z. Li, S. Z. Lu, Z. Y. Wu, K. Tan, N. Minoura and S. Kuga, Int. J. Biol. Macromol., 2002, 30, 89–94. 24 U. J. Kim, J. Y. Park, C. M. Li, H. J. Jin, R. Valluzzi and D. L. Kaplan, Biomacromolecules, 2004, 5, 786–792. 25 U. J. Kim, J. 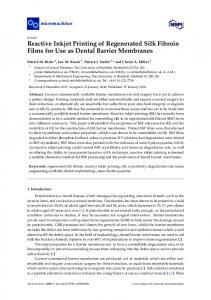 Park, H. J. Kim, M. Wada and D. L. Kaplan, Biomaterials, 2005, 26, 2775–2785. 26 J. H. Yeo, K. G. Lee, Y. W. Lee and S. Y. Kim, Eur. Polym. J., 2003, 39, 1195–1199. 27 K. Y. Cho, J. Y. Moon, Y. W. Lee, K. G. Lee, J. H. Yeo, H. Y. Kweon, K. H. Kim and C. S. Cho, Int. J. Biol. Macromol., 2003, 32, 36–42. 28 J. Nam and Y. H. Park, J. Appl. Polym. Sci., 2001, 81, 3008–3021. 29 L. Zhou, X. Chen, Z. Z. Shao, P. Zhou, D. P. Knight and F. Vollrath, FEBS Lett., 2003, 554, 337–341. 30 W. F. Daamen, P. J. Geutjes, H. T. B. van Moerkerk, S. T. M. Nillesen, R. G. Wismans, T. Hafmans, L. P. W. J. van den Heuvel, A. M. A. Pistorius, J. H. Veerkamp, J. C. M. van Hest and T. H. van Kuppevelt, Adv. Mater., 2007, 19, 673–677. 31 A. Matsumoto, J. Chen, A. L. Collette, U. J. Kim, G. H. Altman, P. Cebe and D. L. Kaplan, J. Phys. Chem. B, 2006, 110(43), 21630–21638. 32 Y. G. Shen, Z. J. Liu, N. Jiang, H. S. Zhang, K. H. Chan and Z. K. Xu, J. Mater. Res., 2004, 19, 523–534. 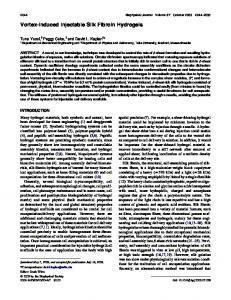 33 K. Yamada, Y. Tsuboi and A. Itaya, Thin Solid Films, 2003, 440, 208–216. 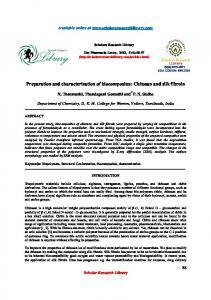 34 M. N. V. R. Kumar, U. Bakowsky and C. M. Lehr, Biomaterials, 2004, 25, 1771–1777. 35 M. Sonoyama and T. Nakano, Appl. Spectrosc., 2000, 54, 968–973. 36 M. Sonoyama, M. Miyazawa, G. Katagiri and H. Ishida, Appl. Spectrosc., 1997, 51, 545–547. 37 H. Y. Kweon and Y. H. Park, J. Appl. Polym. Sci., 1999, 73, 2887–2894. 38 J. Magoshi, Y. Magoshi and S. Nakamura, J. Polym. Sci., Part B: Polym. Phys., 1981, 19, 185–186. 39 H. J. Jin, J. Park, R. Valluzzi, P. Cebe and D. L. Kaplan, Biomacromolecules, 2004, 5, 711–717. 40 X. Chen, Z. Z. Shao, D. P. Knight and F. Vollrath, Proteins, 2007, 68, 223–231. 41 G. Y. Li, P. Zhou, Z. Z. Shao, X. Xie, X. Chen, H. H. Wang, L. J. Chunyu and T. Y. Yu, Eur. J. Biochem., 2001, 268, 6600–6606. 42 O. Rathore and D. Y. Sogah, J. Am. Chem. Soc., 2001, 123, 5231–5239. 43 N. L. Goeden-Wood, J. D. Keasling and S. J. Muller, Macromolecules, 2003, 36, 2932–2938. 44 G. Gente, A. Iovino and C. La Mesa, J. Colloid Interface Sci., 2004, 274, 458–464. 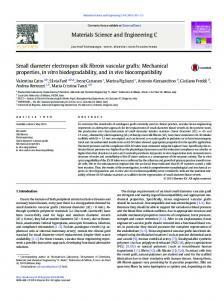 45 K. Tanaka, S. Inoue and S. Mizuno, Insect Biochem. Mol. Biol., 1999, 29, 269–276. 46 B. Lotz and F. C. Cesari, Biochimie, 1979, 61, 205–214. 47 J. R. Yao, D. H. Xiao, X. Chen, P. Zhou, T. Y. Yu and Z. Z. Shao, Macromolecules, 2003, 36, 7508–7512. 48 Y. Liu, Z. Z. Shao and F. Vollrath, Nat. Mater., 2005, 4, 901–905. 49 X. Chen, D. P. Knight, Z. Z. Shao and F. Vollrath, Polymer, 2001, 42, 9969–9974. 50 M. E. Rousseau, T. Lefevre, L. Beaulieu, T. Asakura and M. Pezolet, Biomacromolecules, 2004, 5, 2247–2257. 51 A. Arnedo, S. Espuelas and J. M. Irache, Int. J. Pharm., 2002, 244, 59–72. 52 W. K. Zhang, Q. B. Xu, S. Zou, H. B. Li, W. Q. Xu, X. Zhang, Z. Z. Shao, M. Kudera and H. E. Gaub, Langmuir, 2000, 16, 4305–4308. 53 S. I. Inoue, J. Magoshi, T. Tanaka, Y. Magoshi and M. Becker, J. Polym. Sci., Part B: Polym. Phys., 2000, 38, 1436–1439. 54 K. S. Hossain, E. Ohyama, A. Ochi, J. Magoshi and N. Nemoto, J. Phys. Chem. B, 2003, 107, 8066–8073. 55 M. Tsukada, G. Freddi, P. Monti, A. Bertoluzza and N. Kasai, J. Polym. Sci., Part B: Polym. Phys., 1995, 33, 1995–2001. 56 M. Tsukada, Y. Gotoh, M. Nagura, N. Minoura, N. Kasai and G. Freddi, J. Polym. Sci., Part B: Polym. Phys., 1994, 32, 961–968. 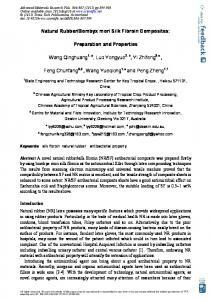 57 M. Z. Li, S. Z. Lu, Z. Y. Wu, H. J. Yan, J. Y. Mo and L. H. Wang, J. Appl. Polym. Sci., 2001, 79, 2185–2191. 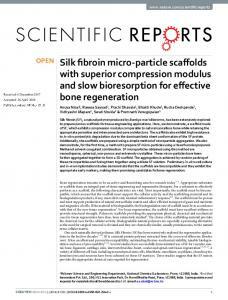 Report "The preparation of regenerated silk fibroin"